Kristy and the team had an unbelievable booth this year covering the entire back wall. The number of brands they are now covering is just amazing and I could have spent the entire day just in this spot alone for a show report. 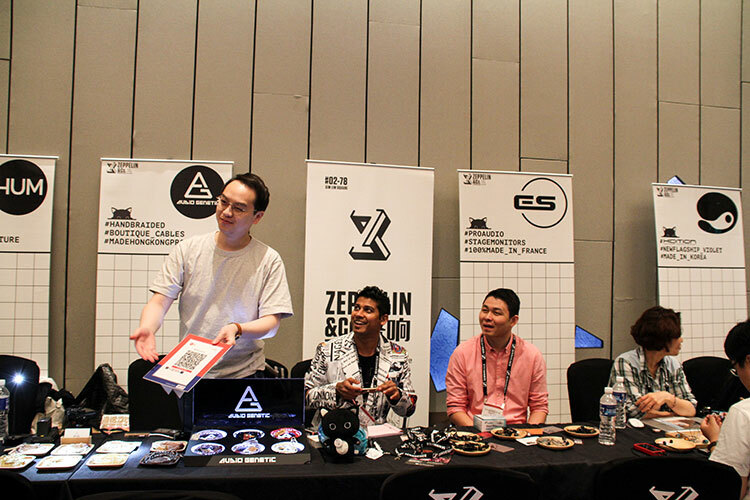 They are a major player now on the Singapore scene but I really will have to get to their store and taste some of that coffee and audio ambiance to go with it next year. 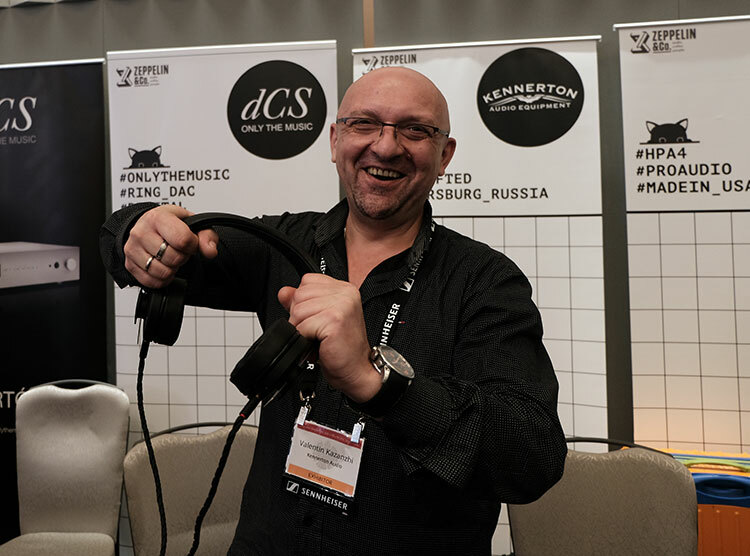 I always spend a considerable amount of time every year at the Kennerton Booth (Zeppelin & Co) and quite a large factor in this is due to their Managing Director, the ever-engaging Valentin Kazanzhi. This man is passionate about his gear, his wood hunting and its infectious to us on the other side of the table. I think he sold a heck of a lot of headphones during the two days. Not just by sheer force of personality, by the way, his headphones are generally quite excellent sounding. Now he had all his big hitters there such as the Vali, Thror, Thridi, as well as the Magni which seemed very popular indeed. 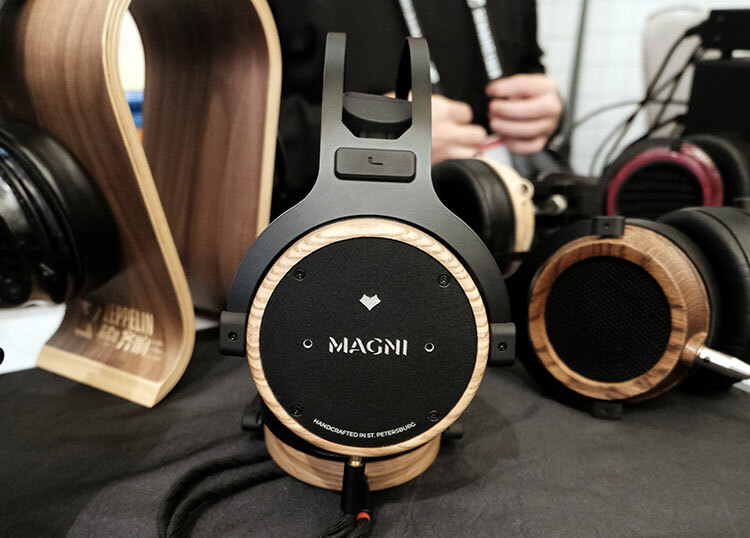 I tried the Thror last year and it is an excellent planar headphone with a beautiful Bog Wood finish. However, what really caught my eye was something a little more modestly priced, their new Jord portable headphone priced at €299.00. 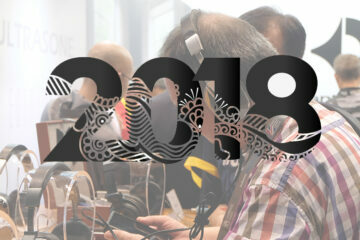 I am also pleased to say I managed to sneak one out of the show and we will be reviewing it in due course on Headfonics. 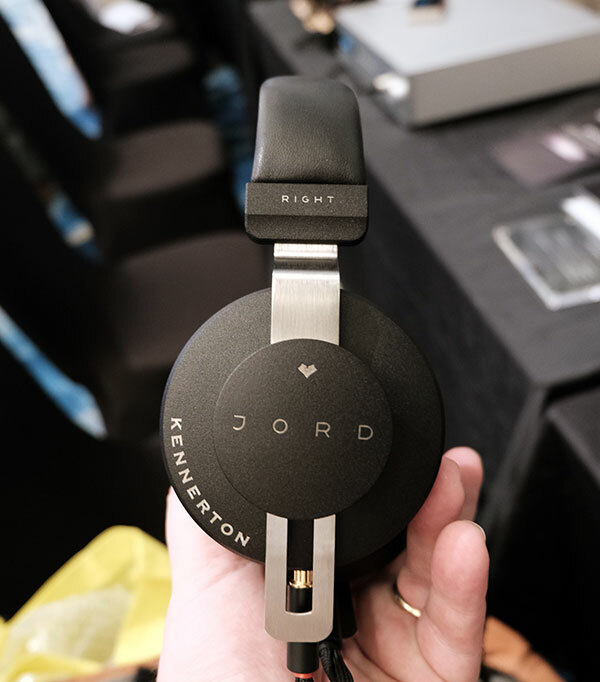 The Jord is a fairly competitively priced portable closed back headphone at the $300 marker. It looks rugged and I can assure you this thing is amazingly durable. How? Because I spent about 5 minutes watching Valentine bend it almost in two and not a single creak or crack could be heard. I like cans that can do that, especially portable ones that are likely to be thrown into bags and take out and about. The Jord is made of an aluminum casing with a hybrid metal cover using spring steel for the headband. Its design is supraaural so it does sit on the ears with a fairly heavy side-clamp but the deep natural leather pads do a good job of softening the clamp to a wearable level. There is next to no downwards or vertical pressure on the head. Wiring is Litz on the inside (connecting to the drivers) and a dual entry on the outside for two supplied cables, a purified 1.25m copper cable, and another same length but with an inline control and mic module. This is an easy to drive portable headphone at 32Ω and 114dB SPL. I had taken a Lotoo PAW Gold Touch for referencing at the show and it sat comfortably at around 65 low gain unbalanced. It is also surprisingly clean, clear and fairly neutral in its presentation, perhaps with a soft tilt upwards in its sub-bass but nothing overwhelming. The resolution and levels of detail are excellent. I know Valentin is pitching this for studio use and it does have a bit of a reference feel to it, at least out of the PAW Gold Touch. I am very impressed, even on such a short demo. By the way, the Jord sold like hotcakes at the show with one guy eyeing up the unit I was demoing so it is a good thing we managed to get this one back for a review later on. Serbia is nowhere near as hot as Singapore or as humid. Malden Panic, the Sales Manager of Auris has his first visit to Singapore and he was kind of blown away by sweltering conditions. Been in this for 12 years myself but you never really get into sync with the heat, perhaps it is genetic? 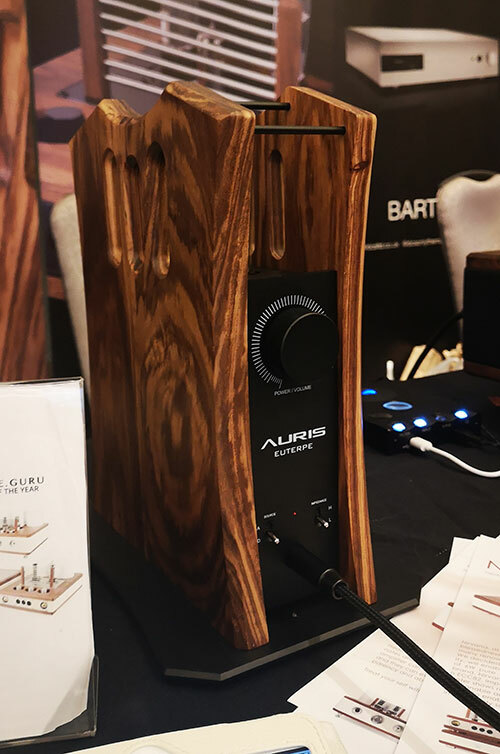 Anyway, glad to see Auris back again under the Zeppelin & Co umbrella booth with some of their latest creations, including their new and very interesting $1699 Euterpe tube amp. The picture above should give you an idea of the pitch of the Euterpe. This is a more compact tube amp encased in wood that doubles up as a single full-size headphone stand. I asked if the heat from the tubes would transmit to the wood and possible affect it long-term but after pressing my hand against it after it had been running for a while I had no such concerns. Auris have done a great job with the construction to prevent any latent damage from the tube warmth. 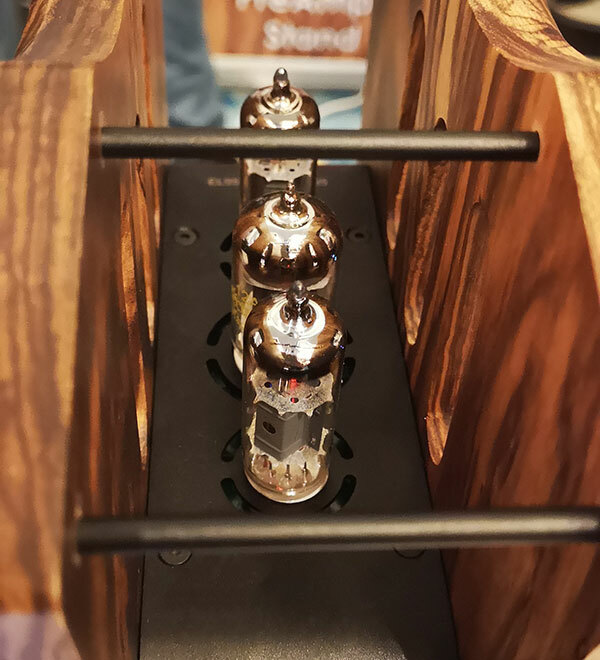 It is also more than just a tube amp, it also has a built-in Sabre DAC solution. If that doesn’t take your fancy you can bypass the DAC with your own line-in source and also use the Euterpe as a pre-amp to something like a power amp. (At the moment I do not have any information on the exact ES chip inside but I would guess at least ES9028PRO upwards given the price point). The tube uses are the exact same as the brilliant HA-2SE with 2 X PL 95 and a single ECC 81. 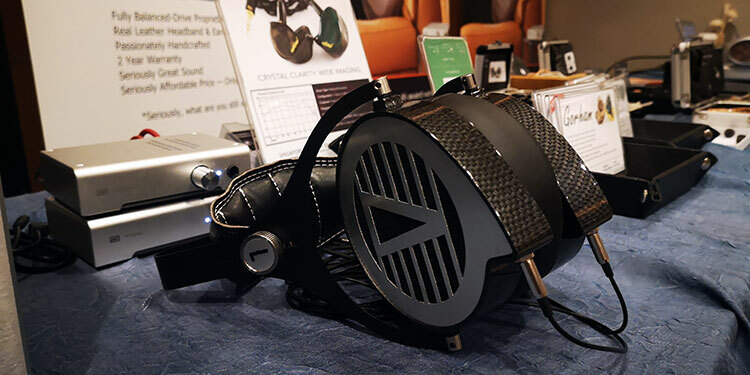 I used a Meze Empyrean as our headphones for testing and my own PAW Gold Touch as the source and what I heard was not something too dissimilar to the HA-2SE in terms of a virtually black background or very low noise floors and a surprisingly neutral presentation. This is not a soft overly rich SET sound with a euphonic instrumental and vocal timbre. It is a lot cleaner and more precise than that. There is also no issues driving the Empyrean with a similar driving capability to the HA-2SE of around 1W into 32Ω. Will we be reviewing it? Yes, I hope so, it does require a lot of home time to hear it properly since the show environment can be quite misleading when using open headphone to test it but it does show plenty of promise. 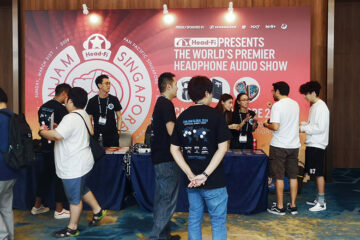 I was delighted to see that Verum Audio’s Verum 1 has been picked up by the dealers in Singapore (SLT Technologies). It was also the first time I have seen it beyond the prototype liquid wood and gold/silver finish prototype design I reviewed last year. The one on show here was a new carbon fiber lack and silver finish though the same curves and form factor as my own. If you have not heard the Verum One before you can read our full review from last year here. It is solid sounding, smoother than the Advanced Alpha, more body than the Hifiman Sundara and slightly brighter than the LCD-2C. Yes, it is a little lacking in micro-detail, not quite as involving and more speaker like in its presentation but at this price point it honestly still punches way above its fiscal pain point. I am not sure what the price was in SG dollars but if it is close to the Kickstarter SRP then it is a bargain in anyone’s language or currency.